Having worked this morning it was time to catch up with outside jobs only a few yards from the house. Some of the frost was melting and there were still fallen leaves to lift, hellebore leaves to cut back and a wander around looking for signs of spring. When we used to keep chickens, it always amazed me that their brain could detect the small increase in day length from the 21st December onwards and bring them back into lay on the 24th or 25th. There is snow on the nearest ridge and on higher ground all around but none here. The hazel catkins are still very tight and new but some will come into the house when the Christmas decorations are taken down. 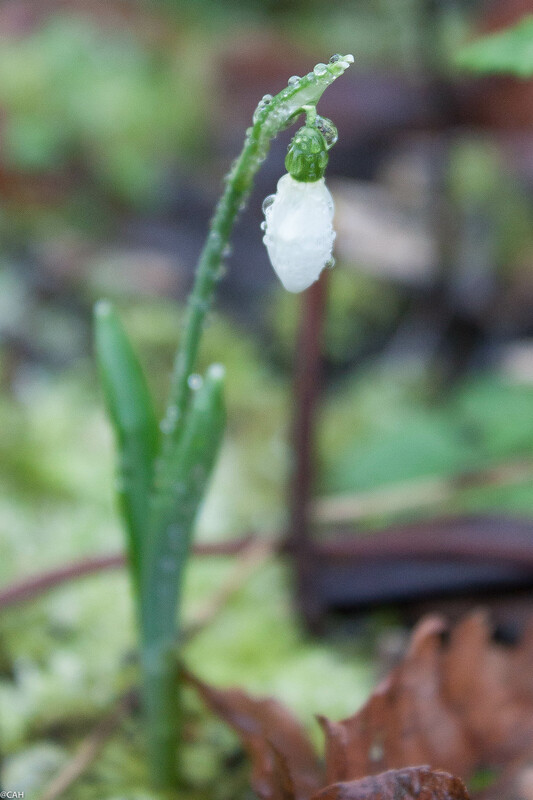 There are lots of jobs that will need doing when the weather improves and I was making a mental list of these when I saw it, down among the dead leaves – the first snowdrop. It may well be hidden by a snowdrift, hail or floods in the coming weeks but what better promise of spring to find near the end of the year.